Milwaukee is investing in green infrastructure to handle heavy downpours. 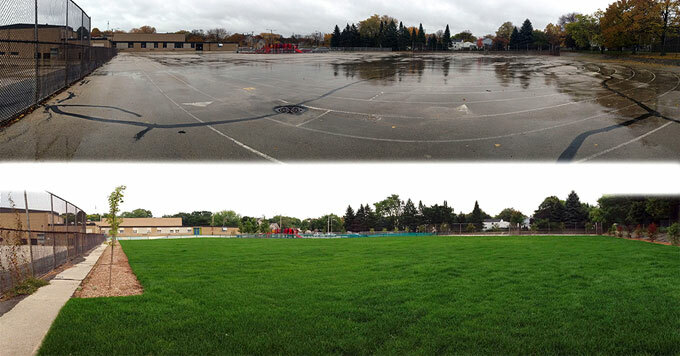 Before and after asphalt removal at the Parkside School for the Arts in Milwaukee (Summer 2016). Image: Courtesy of City of Milwaukee. Like many other cities, Milwaukee’s storm and sewer system was built more than 100 years ago. And its capacity to handle heavy downpours is limited. That’s Erick Shambarger, sustainability director for the City of Milwaukee. He says the city is finding ways to capture and store rainwater. Some of the strategies include turning vacant lots into green spaces, building storm cisterns, and installing porous pavement that allows rainwater to soak into the ground instead of running directly into a storm drain. For every inch of rain, about seven billion gallons of water fall on the Milwaukee metropolitan area. And heavy downpours are expected to become more common. Reporting credit: Mikey Kettinger/ChavoBart Digital Media. Justyna Bicz is a Climate Connections contributor based in Chicago.